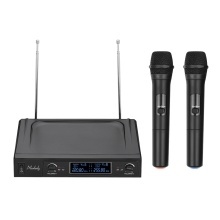 Wireless microphone system with 2 handheld mics and 1 receiver, suitable for home karaoke, business meeting, public speech, classroom teaching, etc. 200-260MHz VHF band frequency and 2 antennas design ensures stable and clear signal transmission, providing you with excellent sound quality. Adopts AF & RF automatic synchronizing technology for quick and easy connection of microphone and receiver. The receiver with LCD display for showing the frequency information and 2 control knobs for adjusting the volume of the microphones separately. With one XLR balanced and one 6.35mm audio mix unbalanced output interfaces for connecting speakers. You will need an extra speaker or amplifier to connecting with the receiver to make the sound working. The batteries for microphones are not included.